Making your first m-Power application can seem like a daunting task. However, a little bit of planning makes the process go much more smoothly. For that reason, when beginning a new application, mrc recommends that you plan out all of the screens before even creating your first screen. Step 1: Choosing a Template The template you choose will enhance or limit the features of your application. Therefore, choosing the right template to meet your needs requires careful consideration. Step 2: Plan your specifications The application specifications make each application unique. They include: application settings, table/field selection, sequencing, field settings, record selections, calculations, external objects, and smartlinks. mrc offers an Application Design Sheet to help through this process. Step 3: The Application Settings specification allows you change the name and description of the application, change the template, choose join types, as well as select advanced search and sort functions. Step 4: Using the Table/Field Selection specification, select the tables and data you wish to create your application over. This specification also allows you to join out to secondary tables as desired. This specification is required in all applications. Step 5: Depending on the template chosen, the Sequencing specification allows you to sequence multiple fields as well as perform subtotaling. Each application must have a minimum of one sequenced field. Step 6: This step is optional, allowing you to choose which advanced specifications best fit your application.The Field Settings specification allows you to delete, hide, and reorder the fields in your application. 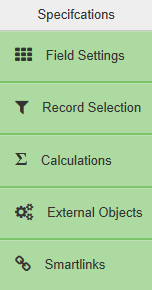 Through Field Settings, you can also change field descriptions.The Record Selections specification allows you to set which records will be included in the application based on a predetermined value or end user input.The Calculations specification allows you to create different types of calculations. Using the External Objects specification you can add preregistered external objects to your application. The Smartlinks specification allows you to add links to other preexisting applications within m-Power. This feature is useful for allowing end users to quickly drill down to detail records. Step 7 Once you have entered all of your desired specifications, you are ready to build your application! After building your application, you can now customize the appearance of your application with m-Painter, or edit run-time properties using Application Properties. At any time you can change your application specifications, including after compiling. If you wish to change the specifications after compiling, you must recompile after doing so.